Australia has published AIG Services Index and Building Permits MoM and the US will release ISM Non-Manufacturing PMI. 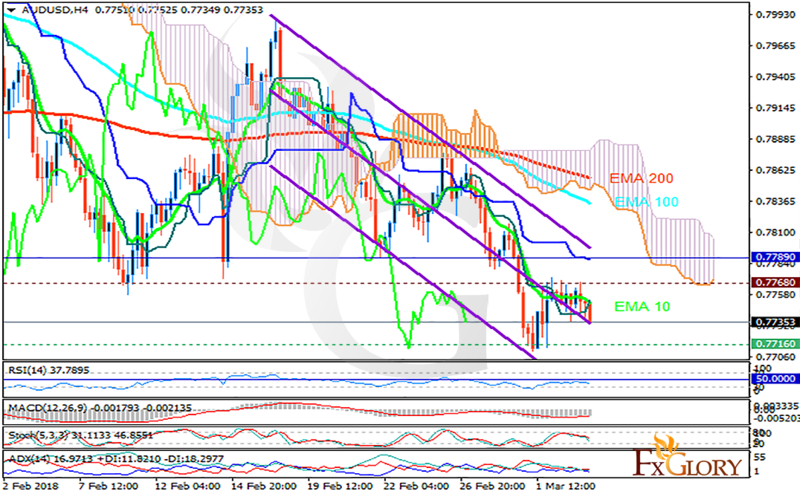 The support rests in 0.77160 with resistance at 0.77680 which both lines are below the weekly pivot point at 0.77890. The EMA of 10 is moving with bearish bias in the descendant channel and it is located below the EMA of 100 and the EMA of 200. The RSI is falling towards the oversold area, the MACD indicator is in negative territory and the Stochastic is showing downward momentum. The ADX is not showing any clear signals. The price is below the Ichimoku Cloud and the Chinkou Span. The Tenkan-sen is showing an upward trend while the Kijun-sen is showing a downward trend. The resistance level breakout will be a sign for buyers to return to the market for the correction pattern, otherwise, AUDUSD will continue its bearish trend targeting 0.75.